When Kyoto resident Clifford Brown was in Kagoshima on vacation this spring, he noticed something familiar in the swirl of volcanic ash in the sky. He noticed Yoshi. 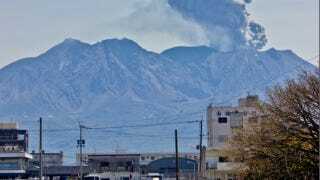 On his Flickr page, Brown recently uploaded the photo and titled it, "Yoshi Volcano", adding that it depicts a "Yoshi shaped eruption from Sakurajima". Sakurajima or "Sakura Island" is an active volcano that was previously an island, but became conjoined with the Kagoshima mainland after an eruption in 1914. Today, the volcano is continuously active, and the area surrounding the volcano is populated with hot springs. "I lived in Kyoto and went for a holiday to Kagoshima with the girlfriend and we went over to Sakurajima and got covered in a horrendous amount of ash," Brown wrote on his Flickr page. "Beautiful place and the natural hot spring footbaths were amazing!" Last year, Yoshi was spotted on a drink carton. In the cannot-be-unseen category, that character sure gets around. You Cannot Unsee Yoshi. I Promise. Have a look at the full image in the link below.